When our guide book commented that Quimper was a real Breton's Brittany, I didn't understand. It exuded the same cultural intensity that we had begun seeing soon after entering Brittany farther south: the bilingual signs, the charming half-timbered houses, the strong sense of pride-in-ownership in their homes, the pleasant urban spaces and the more outgoing people. But somewhere in Brittany, that all faded. We didn't really notice it going away but suddenly it was gone. The daily "Bon Courage" cheers that our "Madrid to Iceland" sign elicited had dropped away as did the other marker's for Brittany. All those elements having already disappeared made the transition into the more typically French region of Normandy unnoticed. 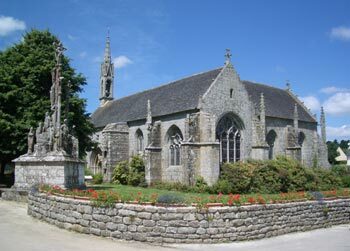 The last Brittany churchyard suitable for picnicking. Riding in Normandy meant pedaling up and down a lot of little hills each day, as we had done in Brittany. I searched for visual features that made Normandy distinctive but came up short. We did wonder if the prosperity level was a little lower in Normandy than in Brittany as "wattle and dab" or sticks and mud suddenly appeared as a common construction technique in the rural areas, though usually only for part of a building. And unfortunately for us, the church yards reverted to the tradition of being cemeteries, which eliminated them as inviting picnic grounds for us. I savor the slow build-up to intense experiences that cyclotouring gives us. So often in our modern society we are clobbered by information delivered so intensely that we can hardly process it. Like with the prisoner abuse scandal in Iraq--when the news first came out I was so horrified, disgusted and ashamed to be an American that I chose not to take in any additional information about it until my psyche could adjust to the new reality. Learning about the carnage at historic war sites can be similarly jarring and upsetting if I suddenly collide with it. But by approaching the Normandy D-Day beaches and memorials by bike, we were spending days building up to the heavy immersion in information, which I knew would make it easier to honor and integrate the experience. I wanted to see, feel, and learn about the battle but in a way that also was respectful to me and in a way that wasn't so intense that I would armor against it. Our warm-up to our D-Day immersion actually began about a month earlier when the BBC and CNN started their remembrance programs in anticipation of the 60th anniversary of the invasion. Map Man's original plans would have put us in Normandy during the celebration, which we chose to avoid. Lodging would undoubtedly be tight and expensive and the appearance of George Bush would also make it more dangerous to be in the area. We filled in the time instead by visiting Brittany for almost a month. 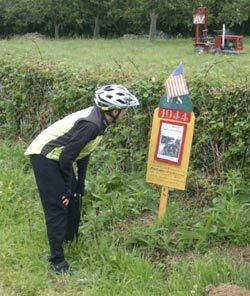 Just before we crossed the invisible line from Brittany to Normandy we saw our first American flags on some solitary memorials, which signaled our approach to the historical area. And as we pedaled parallel to vast sandy beaches I wondered if the invasion beaches would look anything like those before us. 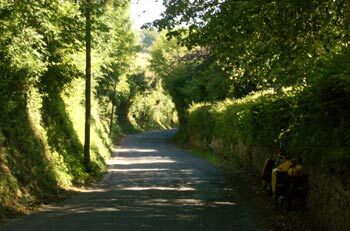 As we left the coast we encountered our first tall hedgerows, which are stone, earth and vegetation walls that turn ordinary roads into sunken corridors. I remembered reading how the notorious hedgerows impeded the progress of troops during the invasions and I studied their various shapes and experienced their confining properties over the passing days. During this time we barely missed being hit by the brunt of 2 fierce storms and I thought of the troops that sat at sea overnight because of a similar storm 60 years ago. One of "F.S. 's" invasion anniversary signs. The day before visiting THE museum about the invasion--the one in the city of Caen ("can")--we noticed a couple of dozen small information signs posted along about a mile stretch of a back road. They were homemade mini-memorials to the invasion and presumably had been erected as a part of the 60th anniversary celebration almost 3 weeks earlier. We stopped at each one though fairly quickly became bored with the poor quality of the photocopied photographs and the only partially decipherable description of events in French. But it was nonetheless compelling to look at them all, in part to honor the passion and dedication that these small road signs represented. "F.S." was the signature on each sign and no doubt he or she undertook this project out of their still deeply-felt experience of the invasion. Every little sign was constructed of 3 or 4 segments of wood, with each piece being individually painted in a different color. The rounded top piece of each sign honored either the US, Canadian or British troops with their unit name and a small flag of their country. Below that was a photo of people or equipment in the area from June 12 to July 30, 1944. Each photocopied black and white photo was carefully covered with plastic and held in place by a home-made wooden frame. Below the photo on a separate board was a hand written description of some event. The shortest vignettes were like "Near this cross an American solider with a bazooka destroyed a Nazi vehicle" or "The villagers greeted the liberators as they walked along this road." It was touching to see that someone still cared enough to expend such a huge personal effort to honor the events of those weeks on this little road where today the cars just whizzed by unaware. It was also touching to realize that people like F.S. probably would not be around to contribute these remembrances to the next anniversary celebration in 2014. We felt privileged to have happened across one of the special efforts put into the anniversary events even though we missed the big day. 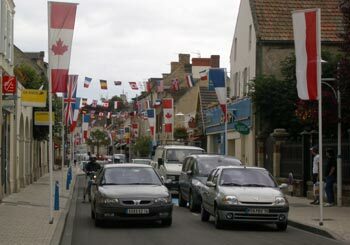 A Normandy town remembering D-Day. Darn it anyway, even though some of the towns were decked out for the anniversary, the French museums just keep missing the mark for us. We were expecting to be overwhelmed by the D-Day museums and instead we found them rather tedious. The French approach to many of their national museums seems to be a photo album or scrapbook approach: they display the memorabilia and as the viewer you are expected to fill-in most of the story. We treasure museums that assume that you don't know the full story, museums that bring you up to speed with words so that you can more fully appreciate the pictures and exhibits. The first 2 D-Day museums we visited in Caen and Bayeux took creative presentation approaches by making the letters and newspaper articles produced during the invasion the heart of their exhibits. But as the curators pointed out, the letters from the soldiers were pleasant chit-chat about the weather and the nice people in France as the soldiers didn't want to alarm their families with the horror, fear, and deprivation that they were experiencing. So at the Caen museum we spent our time reading letters with lot of personal fluff that didn't tell us much about D-Day. The Bayeux museum with newspapers had more content than the one featuring the letters, but still only told parts of the story in a very redundant and chopped-up manner. A key part of the D-Day story was the outrageous amphibious landing of 100,000 troops in one day and just under 1 million in 2 months using an array of innovative equipment designed specifically for the invasion--equipment to accomplish something that had never been done before. I expected to see diagrams, dioramas or models of the concrete boats hauled across the English Channel and intentionally sunk to create an instant port; the new tanks that rolled out a road in front of them as they debarked into water from a boat; some of the specially designed Allied landing craft and the beach obstacles that the Nazi's had in place to foil just such an effort, but none of it was in these museums. Instead, mannequins displaying uniforms and an attic-contents-like assortments of handguns, eating utensils, and food rations that weren't unique to the Normandy landings supplemented the newspaper articles and letters home. We spend over $50 in admission fees for these 2 museums and then begrudgingly dropped another $50 on books from which we would learn the stories that the museums neglected to tell. The 2 German military cemeteries we visited in Normandy beaches area didn't discuss the technical innovations used in the landing but certainly packed a punch in a small amount of time about the personal tragedies that the French museums skirted around. The German military cemeteries all have a side room where they potently lobby for peace and understanding instead of waging another war. On their Normandy display boards they also had posted selected stories from German troops, Allied troops and French civilians, each presented in German, English and French. Each story is a riveting, heart-felt testimonial about the anguish and personal costs of the war and provides a brief immersion into the battle scene or aftermath. The intensity of the narrative experience is artfully juxtaposed to their always very peaceful and reverent-feeling cemetery grounds. We always detour if a German military cemetery is nearby as each has a very unique design that is masterfully done--it's amazing how they always foster a quiet, comforting feeling in us and set the militarism aside. Those big red arrows on the strategic maps at the cemetery. The German military cemeteries send the message "The battle is behind us, let's remember the fallen individuals." In contrast, the vast and grand American military cemetery that is also immaculately maintained rather jarringly insists on keeping the battle before us. The grand stone arcade and semicircle listing the names of the missing in action was flanked with 2 wall maps, each several stories high. 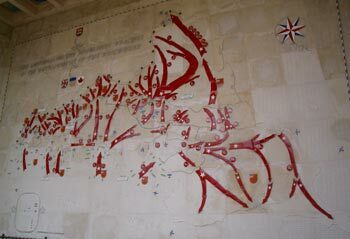 One outlined the overall Allied troop movements in Europe while the other focused in on the landings and advancements in Normandy, each with more than 50 shiny red enameled arrows depicting the sequence of action. I went from being in a heart-felt place of honoring the sacrifices of the thousands of young men to being in a more intellectual space demanded by the maps. I felt simultaneously drawn in by the appeal of the information of the war and repelled by the incongruity of it in the cemetery setting. As I moved away from the maps and out amongst the thousand of gleaming white crosses and scattered Star of David's, I slowly began to again reflect on the human loss and suffering of the war. As I walked under the neatly trimmed trees surrounded by the graves I noticed an opening onto a beach viewpoint, a beach where perhaps some of these men had died. I anticipated a poignant moment at the overlook but was again unexpected jarred by another strategic map with thick red arrows, though much smaller than the first two maps. The explosion pattern of those red arrows seemed so violent in a place that I expect to be serene. Though these men died very violent deaths, this didn't seem to be the place to focus on that message. If the designers felt the need to tell the strategic details of the D-Day story, I would have much preferred it be told in an anteroom as an introduction to the memorial garden rather than being interwoven as it was. It was the people, not the mission, that I felt should be the focal point here. Bill commented that the Pearl Harbor WWII cemetery had the same kind of giant map boards as we saw in Normandy. 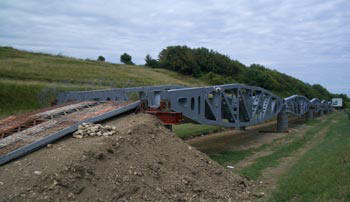 Concrete pontoons for floating bridge at Arromanches. Curiously, I felt more emotional power at Omaha Beach, the amphibious landing site of thousands of Allied troops and equipment, than at the American cemetery. Despite the mostly sunny skies, bright blue sea, broad sandy beach, and elapsed 60 years, it felt like a very sad place. I was distressed by the tacky little miniature golf course irreverently placed too few feet away from a remaining concrete pontoon hauled across the Channel for the landing. And though life goes on, it was incredibly incongruous to see the sunbathers flopping around where so many people had died. Regardless of the loveliness of the setting, I wouldn't want one of the beach homes across the road. Perhaps it was because this, not the cemetery, was the place of anguish and suffering of so many that it felt more sacred to me. Most of the D-Day museums were so disappointing that we started passing by the smallest ones and sent Bill in as a scout to the middle-sized ones. I was content to sit with the bikes and read about D-Day in my books while he checked-out the consistently dull museums. But at the end of our loop through the historic area of the D-Day landings we found a museum with more information about the uniqueness of the landings. There they did have dioramas to illustrate how the giant portable harbors were assembled in days instead of the usual months and some of the specially designed landing equipment. And on the beach we could still see remnants of the harbor and portable bridge that were intended to be used for days that were instead used for about 6 months. Section of relocated floating bridge. Our brief study of the Normandy landings again reminded us about the cultural differences in attitudes and how it seems to us that the French are more attached to saving face and maintaining a position than solving the immediate problem. In one of the books I was reading about WWII, the British author mentioned the British dismay when over a 100,000 French troops that had been rescued by the Brits at Dunkirk opted to return to France and presumably sit out the war in the German-occupied country rather than join the Allied Forces in fighting to liberate their country. One can easily imagine that the losses of equipment, ships and lives in the evacuation would have been substantially less if 1/3 fewer people had been transported. And I assume that the number of French seamen on British soil when Britain held their ships at the time of the occupation must have been in the thousands and they too chose to return to France to sit out the war. From the bit I have read, it sounds like the rational for their decisions was basically to spite the Brit's because they didn't like what the Brits had done or that the British actions had fallen short of their expectations. We were dumbfounded to read about this and assume it was generally in the spirit of saving face at the expense of the bigger picture. Learning of these French actions brought to mind our visit to Auschwitz in Poland last year where we learned how large the Polish resistance had been in WWII and that it vastly outnumbered those in the French resistance. We both grew-up hearing the stories about the French resistance and hadn't heard a peep about the Poles and wondered why. Subsequently we learned that the size and effectiveness of the French resistance had been intentionally inflated after the war to promote French unity and restore pride. The disparity in the resistance stories came to mind again when a Normandy invasion museum's numbers suggested that during the Allied invasion and the battle for France that there were almost as many Poles as French fighting for France. Elsewhere I had read that Poles represented 10% of the British fighter pilots. These stories left us wondering why the politically incorrect joke we grew up with wasn't instead: "How many Frenchmen does it take to screw in a light bulb?" With this WWII information in mind, I began looking back at our most infuriating moments with the French, wondering if our new hypothesis would hold, that the French tip the balance more heavily to saving face in the short run whereas we are more biased towards an immediate solution to the problem. In the news the last few weeks I had heard an opinion that the French political policy at this point was to object to anything the US was doing, just as a matter of principle. And I remembered thinking at how short-sighted Chirac's slight of Bush seemed to me in not attending Reagan's funeral even though he was already in town. I also remembered last year when a very personable surgeon assured me that he wasn't using any latex on me in respect for my latex allergy. When it came time to apply the bandage, he and his nurse had a distressed-sounding conversation in French while she held an empty supply box in hand--one that I wondered if normally contained the latex-free bandages. When my wound later split open, presumably from the poor healing due to the latex-induced allergic reaction, Bill called the surgeon to determine what new solution or other product I might now be reacting to. Without hesitation (or apology) the surgeon said "It was the bandage." Amazingly, his need to save face apparently came before patient care when he applied the latex-containing bandage. That bandage could have triggered a potentially fatal respiratory reaction in some people with latex allergies. And it was hardly a situation without a solution--it was mid-day and his nurse or Bill could have trotted down to the pharmacy to pick-up an appropriate bandage. And many of the more minor irritations and inconveniences we have experienced at the hands of the French seem to fit the 'face-saving over problem solving model.' The hotel clerk that insists that the telephone line is no longer blocked but refuses to come to the room to see that the phone is unusable. The Parisian store manager that was decidedly unpleasant when I asked for a refund on an item that was charged at three times its cost--if anything, I thought I was a due an apology, not an affront. And there had been the various French staff people that are utterly non-negotiable as to where we can park our bikes: their first pick is always the only possible option and any of our string of offered options are always unacceptable. The list goes on, and it seems that it is the need to save face in situations where we don't even realize that honor is at stake that throws us for a loop. Bill and I both had a good laugh when he read a quote from Eisenhower in his new 600 page book on the D-Day landings in Normandy. Eisenhower noted in his diary one day "The Difficulties of the Commander" and the first item was "Dealing with the French" which he followed with 3 paragraphs of details. I had wondered if the part of the French affect that grates on our nerves was a face-saving reaction to their quick WWII defeat and subsequent collaboration with the Nazis, but apparently in was already well-established by 1944. During our 2 months in Spain we frequently commented on how much we were looking forward to going to Iceland, as traveling in Iceland would be a very different adventure than those on the continent over the last 3 years. And we were especially excited about setting foot on the geological phenomena, the Mid-Atlantic Ridge, which in most other parts of the Atlantic is deeply buried under the sea. But not long after arriving in France, fretting replaced fantasies about our Iceland trip. It was an Australian cyclotourist that raised our concern about the voyage during a chance roadside chat along a river road in southern France. He mentioned that he had just learned from a call to his wife back home that his summer trip to Iceland had been cancelled because the ferries were already booked for the season and this was only May. We wished we could have talked to his wife just then to get the details as he couldn’t answer the stream of questions that came to mind. Our next chance for checking on the ferries at an internet shop didn’t come soon enough, but the news wasn’t good. Bill did a preliminary scan of the ferry schedules and found nothing available out of Scotland, our planned departure point. It wasn’t supposed to be like this. Iceland was supposed to accommodate our new Type B personality approach to life. Months ago Bill had done a little background research to determine the best time of year to be there and that taking a ferry from Scotland would be the best approach for us with our bikes. We had planned to buy a guide book in London and get serious about a July trip to Iceland sometime in June. Instead, we were having to revert to our well-practiced Type A styles to pull this trip off. Buying a guide book in Paris and solidifying our plans quickly were necessary to have chance at visiting Iceland this year. And the 2 week ride to Paris was sprinkled with brainstorming and contingency planning about Iceland instead of the more pleasant previous images of just showing up there and pedaling around. We felt lucky to snare a just released 2004 edition of a guide book for Iceland, so fresh in fact that the clerk pulled it out of a box in the back room when I pressed her for the current edition. After a quick scan for some key details, the next stop was putting in a few hours on the internet. Bill searched out all the transportation options from a 6 day ferry ride from Norway to a budget flight out of London and then using a rental car or RV once we arrived in Iceland. I explored geologic special interest group tours, organized bike tours, and other options that would cover the lodging as we were now concerned that if transportation to the country was getting locked up for the season that lodging once we arrived might also be a problem. Our separate research led us to the same disappointing conclusion: that Iceland would need to be visited without the bikes if we were going to do it this year. The available ferry trips were just too many nights at sea and too expensive to be practical for us. Budget flights were readily available from London, but those airlines don’t like dealing with bikes and their strict luggage weight limits on the Iceland flights would make it even harder. And what I was learning about Iceland suggested a lot more planning and research should be undertaken before embarking on an extended bike trip there. The mention in our guide book of heavy, persistent rain and fog; gale-force winds; sand storms and insect swarms didn’t sound like our kind of biking. And the organized bike trips all mentioned the use of vehicles to help the bikers cross rivers intersecting the routes. We are into cyclotouring for the fun of it, not the athleticism potential, and it was sounding way too much like an Ironman event. We had to make an on-the-spot decision at the internet shop, so settled on going to Iceland but not as cyclotourists. We picked travel dates out of the air and Bill made flight and rental car reservations. I decided that the exorbitant prices in Iceland justified having our sleeping bags mailed to us from home. A priceless tip from our new guidebook was about sleeping bag accommodations in Iceland—some guesthouses have substantially discounted rooms if you use your own sleeping bag, pillow and towel. Not only would it save us a bundle of money, but it would vastly increase our lodging options should availability be tight once we got there. We also realized that our clothing wasn’t warm enough for standing around in cold weather—it’s all selected for exercising in cold weather, not standing or strolling. So we opted to have a warmer jacket for each of us included in our box. This unexpected shipping meant enlisting some help from back home, both in rounding up the items we hadn’t anticipated using this year and having it sent off to us. My emails read like: “Look for the size small yellow jacket with a hood and 'Vaude' on the sleeve. If the sleeping bags aren’t under the bed look in the closet on the right and if they aren’t there….” We of course no longer have a real home and haven’t spent much time with our belongings since moving out of our house, which makes tracking things down by long distance very difficult. Our newly conceived Iceland trip would also require an address to which our sleeping bags could be sent and a very secure place to stash our bikes while we were up north for over 2 weeks. We hate imposing on people but reluctantly asked a British couple we met in a campground in 2001 if they could help us after exploring several other fruitless options. Fortunately for us, these new friends graciously helped us out by being available to both receive our shipment and storing our bikes. It took hours of unexpected research, planning and coordinating, but “Plan B” for Iceland was emerging. Bill using all his resources for reservations. The next step was sewing up high season lodging at both ends of our trip in London and Reykjavik, both very expensive cities. In the two cities the target quickly became finding some place to stay for under $100/night. Accommodations in Reykjavik that cost $300 sounded comparable to what we had paid $65 for in Paris. Even sleeping bag space at the Salvation Army guest house was $85/night for 2. In London, to keep the price just under $100 meant we’d be walking up 6 flights of stairs, have a room on the street-noise side of the building instead of the garden-side and be sharing a bath down a floor. I hate making reservations months in advance when you don’t really know what you are getting, but since the first several places I called in both cities were already booked, I was grateful to finally get reservations at all. 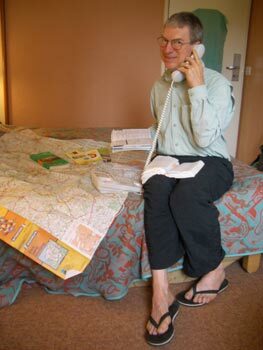 Bill normally does all of the trip planning, but he was swamped with fitting our route around lodging availability while in France and the thought of also doing detailed planning for the Iceland trip was overwhelming. Since the trip to Iceland was going to be a budget breaker and we were now locked into a fixed time schedule, we needed to arrive well prepared. I assigned myself the task of reading the Iceland guide cover-to-cover before we arrived--something we never do. Fortunately it is smaller guidebook than most. So for weeks my evenings were filled with underlining any site in the Iceland book that seemed like it might interest us. At night, my dreams were filled with images of Iceland instead of our current host country, France. Geysers, auto problems, and shopping in late-night sun disturbed my sleep and the list of food items that we would haul with us to Iceland to combat the high prices kept getting longer. So much preparation was necessary for our Iceland adventure that planning it became a parallel experience to our travels through France and it was an unwelcome stress. It was hard to let go of the biking aspect to the trip, especially since July is usually when we are at our peak of fitness. But instead of ending this July in top form in the beautiful Alps we'd be at our lowest conditioning level in the last 4 years. Our over two month tour of France ended abruptly with the visits to the Normandy D-Day beaches. It was one of those jarring passages that bike travel usually prevents. But one day we spent the morning biking past the last of the invasion commemorative areas with all the signs in French and in the afternoon we were biking on the left side of the road in a busy English port city. Gone would be aggravations with the French and the French language, but gone too were the yummy grocery-store vinaigrette salads. Suddenly and for the first time in our travels, we would be surrounded by English speakers. The bumpy ride across the English Channel in rough seas foreshadowed our first hours in England. Stepping out onto the Portsmouth streets was predictably disorienting with traffic all going the 'wrong' way. As pedestrians, we quickly settled on reminding each other at intersections to "swivel head" or look each way 3 or 4 times very quickly in lieu of being able to anticipate where the traffic would be coming from. Each walk across a street was a nervous experience. And riding our bikes in traffic was equally disturbing as many of our automatic responses were now wrong. We trusted that as soon as we left the city traffic that we'd gradually be able to ride with more confidence instead of feeling like exposed rats scuttling along the edges. One of the very unexpected sensations in traffic was the feeling of running into myself when a vehicle skimmed by too close on my right side--I had a new understanding of the 'handedness' of my riding. For the tens of thousands of miles we have ridden, almost 100% of the traffic has whizzed by on our left sides. Apparently my mind-body are totally habituated to that and the cringe-recoil reflex in response to a vehicle passing too close draws me to the right side. Even if there is no space for my bike to track farther to the right, there is a right-sided pulling away of my upper body from the vehicles on my left. The first time in England that a car startled me by its closeness, I started wobbling: my current experience told me to retreat to the left and apparently my ingrained response to that pattern of sensations is to retreat to the right. The collision of all of my past experience and the conflicting new experience was so chaotic that it was unfortunately reflected in my unsteady bike handling. Once out of the unnerving traffic and in our hotel room, I dug deep into the bottom of my pannier to pull out the bulky electrical adapter that I carried since February just for England. It felt like a trophy in my hand as it enabled us to begin cooking dinner immediately upon arriving. After the adapter, the next item on the list for our transition to the new country was an ATM for British pound notes so we could participate in the economy. Through most of Europe we can now slide between countries without worrying about the current or the currency, but not so in Britain. As in any new country, a trip to the grocery store was high on the list. I held my breath as we sorted out the price differences between the muddle of 3 currencies in my mind and once again looking a both metric and English measures of goods. Indeed, most everything in the market was more expensive than on the continent. Happily our favorite pasta sauce was available, but at a 50% premium, as was the pasta. Most of the produce was also about 50% more than we had been paying. But there are always surprises and a French brand of sunscreen that we had paid $17 for in France was just over $5 in Portsmouth. The product made for the English market was made in Poland instead of France. It was absolutely delightful to casually interact with the people around us. We nabbed the first person we saw on the street when we needed directional help and were thrilled to easily be able to communicate in what is often a challenging situation. And I loved being able to ask for help in the grocery store--so often if I can't find something in a European market I have no choice but to silently revisit all of the shelves until I find the item or give up. Here I could just ask. But despite being in England, we couldn't seem to shake some of our old problems. We spent 2 nights in a better hotel in Portsmouth to have much needed phone line access and a TV to catch up on the news. Unfortunately, the management at the fully booked hotel didn't know that an entire wing had non-functioning phone lines. (Another case of the whinny, persistent Americans: the staff person had noticed that a number of people had been inquiring as how to use the phones, but we were the only ones to follow up when we still couldn't place a call.) And we were heartbroken to watch part of the first day of the Tour de France without any sound--the audio feed to the hotel wasn't working on the sports channel. A further disappointment was to discover that the BBC in Britain is neighborhood news and not the World Service we were accustomed to. We left the TV on for hours and only 4 or 5 major stories were covered, only one of which was an international story and there was absolutely no mention of the Tour de France even being underway. So, even though we were now in an English speaking country, we still were going to be challenged to keep up on the international news. After a day at the Portsmouth museums, we headed north out of London by a mix of bike and train travel. We had lingered a little too long in France to bike all the way to our friends house where we would leave the bikes while seeing Iceland. It didn't take long on the country roads to be horrified by the heavy traffic spilling onto the little one-lane back roads that in most countries are usually a cyclist's haven. Instead, these narrow roads were overused by cars and made for some hair-raising biking. The hedgerows boxed the pavement in even more tightly than in Normandy, leaving us absolutely no where to go in a pinch. We were of course still struggling to recondition ourselves to making a right hand turn and ending up on the far left edge of the road while dealing with the heavier than expected traffic. 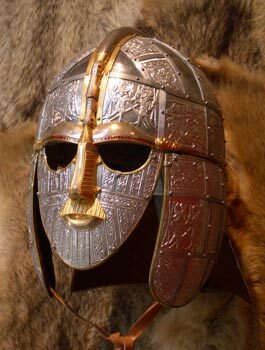 We did squeeze in one sightseeing stop along the way at Sutton Hoo, the site of a series of early Anglo-Saxon burial mounds from the early 600's. They were very similar to the Celtic burial mounds we saw in Austria and Hungary except that the seafaring chieftain was buried in his wooden sailing ship. The wood had entirely rotted away but the imprint of the boards was left in the soil as were the original iron rivets holding the boards together. Our real joy in England was however reconnecting with the Kelly's, the couple we met in a campground back in 2001. It was such a pleasure to spend the night in their quiet village home. Being in a house with bright, fresh rooms and a lush garden out the door is hardly our daily life experience on the road. We always relax more deeply when we are cocooned by such inviting surroundings. They treated us to delicious home-cooked meals, graciously stored our bikes and biking gear, and lent us a suitcase for our overflowing Iceland luggage. Our panniers are not well suited to being used as regular luggage and we had bought 2 light-weight carry-on type bags hoping they would be big enough for all our gear. But the sleeping bags just took up too much room and so the loan of a bag at the last minute was a huge help. The next day we hopped a train south to London for a 4 day visit before heading off to Iceland. 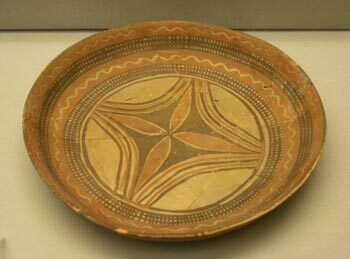 An early ceramic dish from Mesopotamia. Being in England made us feel like student travelers again. Even a short hop, round trip travel on the London metro cost about $15 for the 2 of us and entry into a Portsmouth museum had set us back $60. The bus in London is about half the metro price, so we used the bus if we didn't walk both ways to visit the free museums, favoring them over ones with admission fees. Fortunately, the main British museum asks for a donation and doesn't have a mandatory fee. And at their main location they also have over a dozen short tours available, from which we selected the free events. We enjoyed the museum's historical overview covering thousands of years and were taken with this little dish from 5,500 bce. It was a potent reminder of how early in the history of ceramics that some cultures were producing very fine ware. The sophistication of ceramic works seems to have come and gone over the ages instead of steadily getting better with time as I would have expected. We had finally finished our 'big book of Celts' just before arriving in London--a coffee-table sized book we have hauled with us for over 2 months. Unfortunately we immediately replaced it with an historical atlas on the Vikings, though it was much smaller and lighter weight. The popular history of Iceland is heavily laced with stories of trolls and monsters, so we opted for a more general history book of the Nordic countries to bring us up to speed on Iceland. The Vikings were the first permanent settlers in Iceland and we believe that the Vikings are the last major western European culture in our survey course. We are back in London after our 17 day, non-biking trip to Iceland. We are doing a little sightseeing before we pick-up our bikes and put the "cyclo" back in our touring. We'll spend about 6 weeks biking in Britain before turning south again, perhaps heading for Spain by boat.